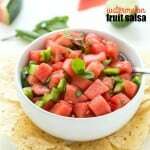 Watermelon Fruit Salsa - A healthy and irresistible fruit salsa made with fresh, summer ingredients. Perfect for your next get together, no one will be able to stop munching on it! Best served with tortilla chips or served on top of chicken, pork, beef, or even on a spoon. Place the watermelon, jalapeno, green bell pepper, mint, lime juice, and salt in a medium bowl and mix together until combined. Cover with plastic wrap and place in the refrigerator for 15 minutes. Uncover and serve with tortilla chips.